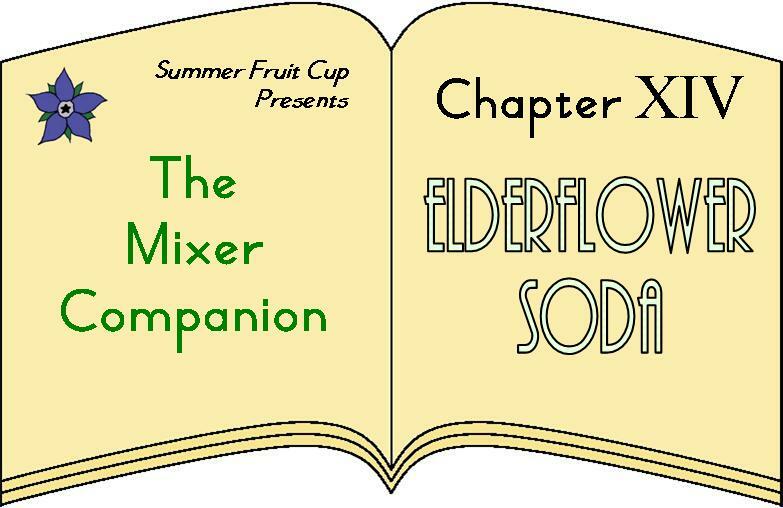 One of the most British flavours around is Elderflower; I even had a journalist for a Brazilian newspaper contact me recently regarding its use in British soft drinks. 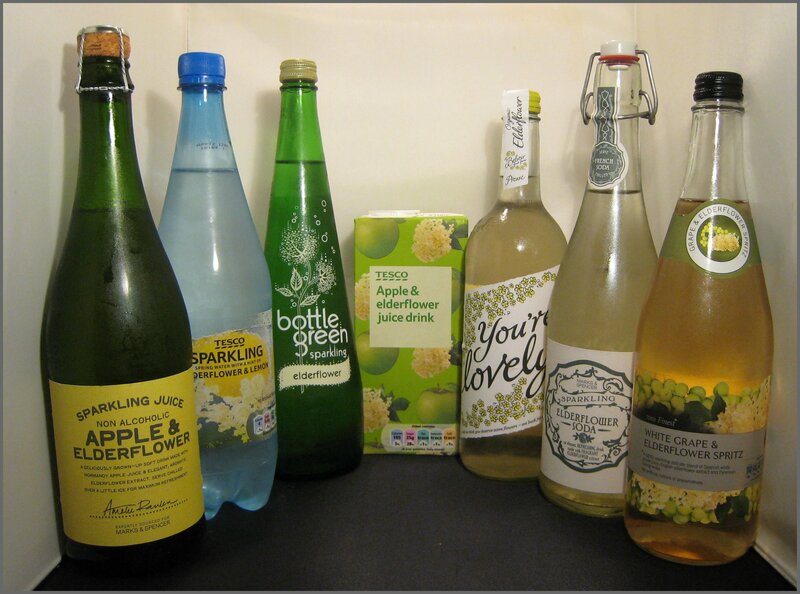 For decades, this came in the form of Elderflower Wine, but, over time, Elderflower Cordial became more popular and, once it grew fashionable to mix this with still or sparkling water, companies started bringing out a ready-to-drink carbonated version. The two companies that started this were Bottlegreen and Belvoir, both in the late 1980s. This is a lovely golden colour and is packaged in a bottle with a champagne cork and cage. 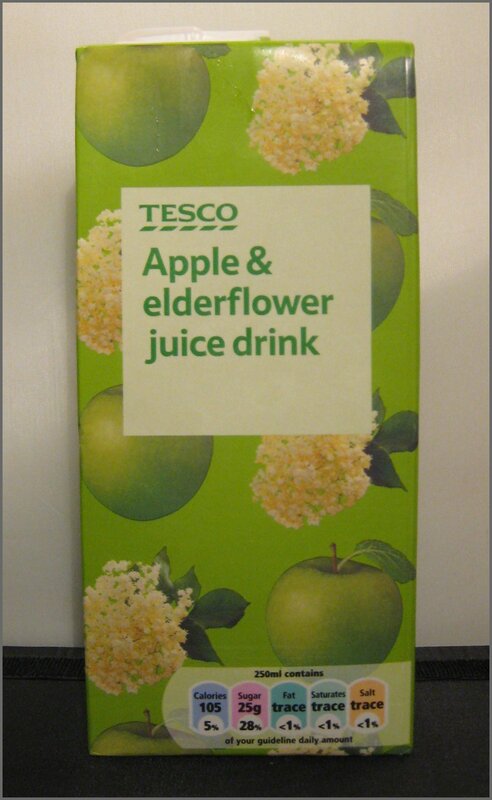 There are some apple notes, followed by floral elderflower. Not too sweet, it’s sufficiently tart and dry thanks to the apple, but very fizzy. A nice non-alcoholic alternative to provide when having champagne. Very fizzy. Quite light and not too sweet, this has a slight chemical floral flavour to it, a bit like furniture polish, but not necessarily in a bad way. Moderately refreshing, with a floral finish. A bit musky, with a nice nose of elderflower to start, but this fades into more of a watery flavour; there’s still some elderflower there, but it’s a bit disappointing when it comes to the taste and needs more flavour. Also, we thought this was a bit on the gassy side, with a medium-to-high fizz. Bitter finish. This has a medium level of fizz. The grape notes make it a bit syrupy to start, but then some musky floral from the elderflower appears, accompanied by some tartness. The finish is dry and slightly sour. We thought this was quite fresh, but would be better with some ice to take the edge off of it. The wild card, this variety is still. It’s quite sweet, but there’s a good balance between the apple and elderflower flavours. There is also a note of sweet liquorice towards the end. This is very easy to drink, if a touch sweet; best not to have too big a glass at breakfast. This has a sweet, jammy elderflower nose. 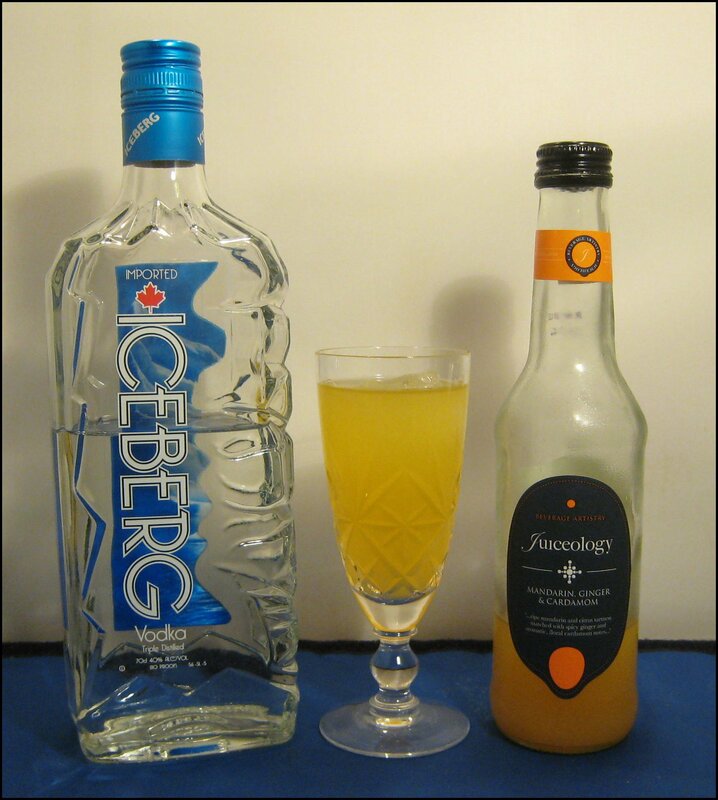 To taste, it has a medium level of fizz and is musky, sweet and floral, with a citrus tang at the end. 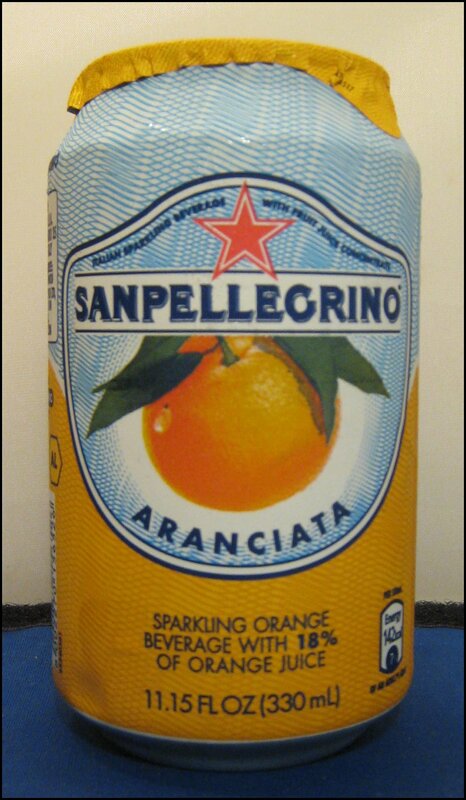 Quite good, we found this to be refreshing and neither too sweet nor too fizzy. Good balance. Very highly fizzy and very floral, this isn’t too sweet; it’s more dry then anything. Also, the floral notes seem to be more like rose than elderflower, giving a distinct impression of Turkish Delight. The taste seems short-lived, but, after a short absence, the flavour of fizzy floral sweets (Refreshers, Parma Violets) pops back up again, before disappearing, leaving a clean finish. Very pleasant, this was full of floral notes with both tartness and sweetness. It was fresh and very easy to drink. Frankly, this was superb and exceptionally refreshing. 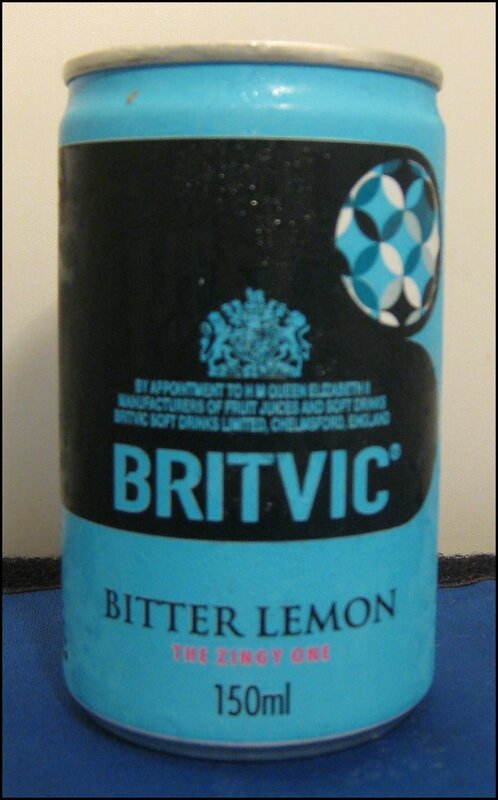 Bitter Lemon is essentially lemon-flavoured tonic water, although it tends to be more flavourful and sweet than tonic water “with a hint/twist of lemon”. Given its links to tonic, it’s perhaps not surprising that the credit for its creation is claimed by the soft drinks firm, Schweppes.Since 1950, the Research Team at Schweppes had been working on creating a Bitter Orange Soft Drink and by the mid-fifties, Lyons, a rival firm, had brought out a new drink: Tonic Water mixed with Lemon Juice. 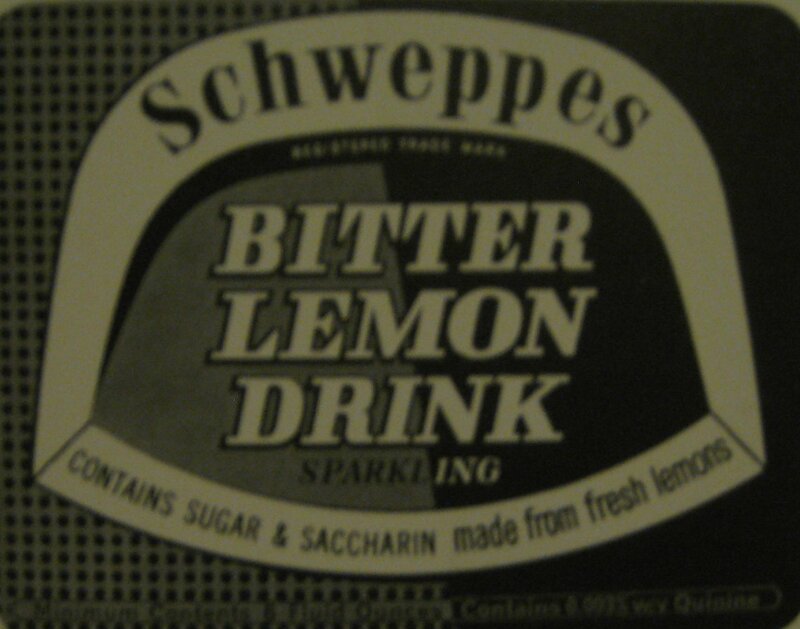 In response, the team at Schweppes started working on making a Bitter Lemon, too. On the 1st May 1957, Schweppes Sparkling Bitter Orange and Sparkling Bitter Lemon were released. In the first quarter they sold 500,000 and 250,000 cases respectively. 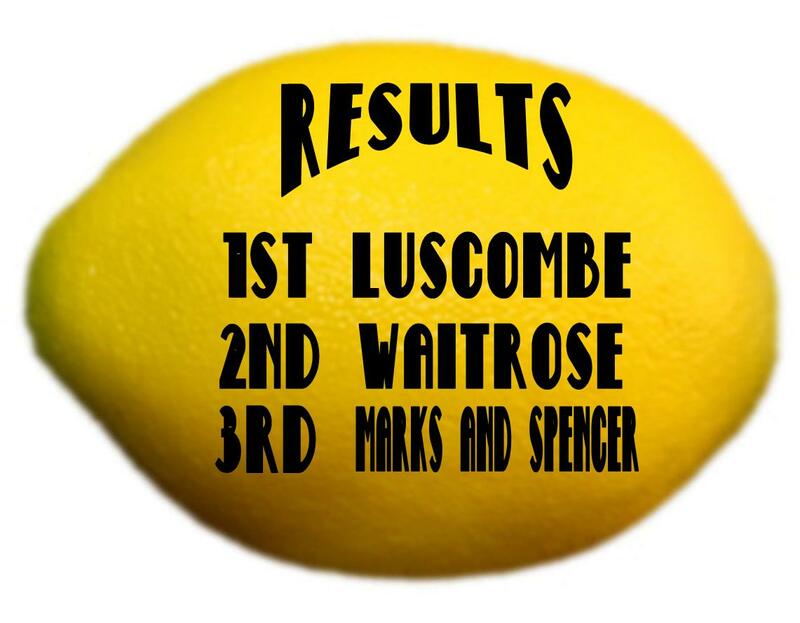 After a television advertising campaign, sales of Bitter Lemon soared far above those of Bitter Orange. In fact, for a time, their sales even outstripped those of their Tonic Water. 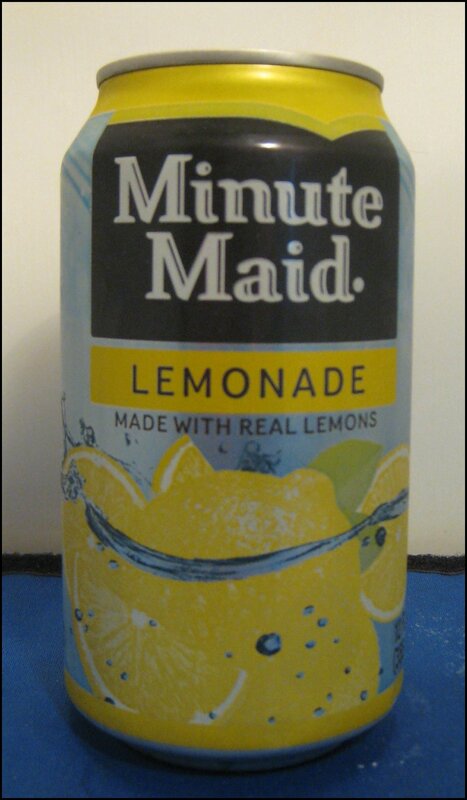 By 1959, other companies had released competing products and, as market share, sales of Bitter Lemon dropped and Tonic Water became top dog again. 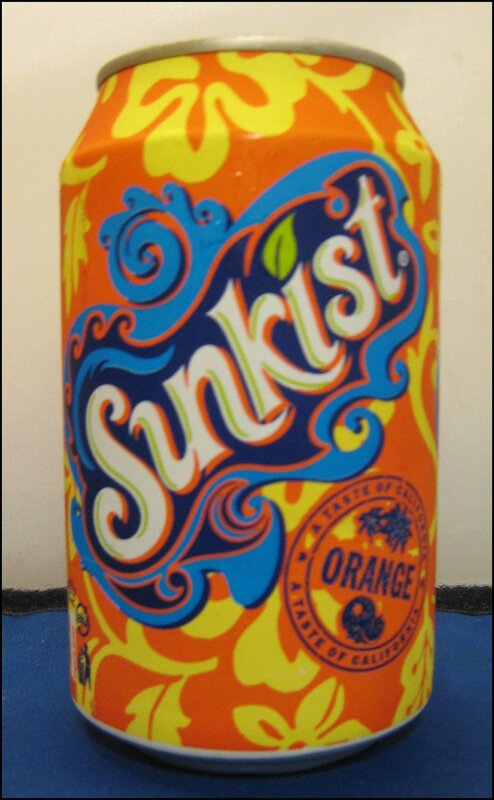 Since then, Bitter Orange has been discontinued, although it is still made for some non-UK markets such as the USA. 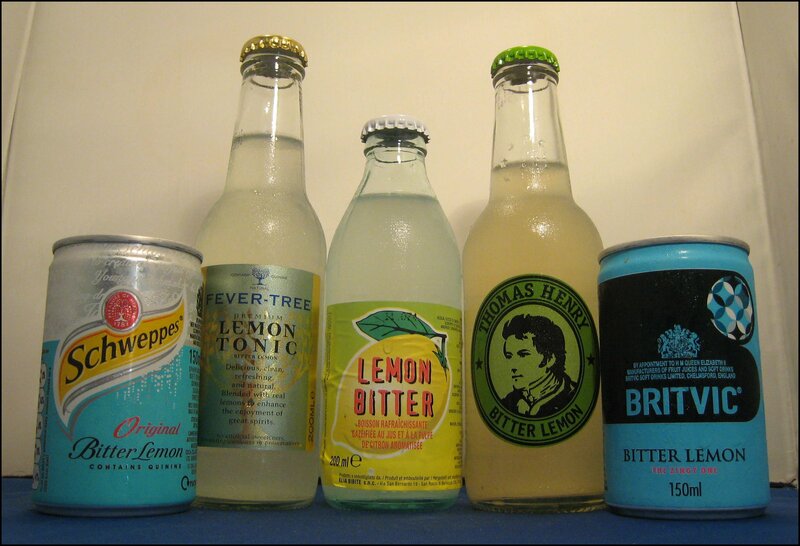 In 20__, Fevertree released a Bitter Lemon and in 2010 they renamed it for the off-trade market as Lemon Tonic, to reflect its soft drink ancestry. Today, most Bitter Lemons still contain quinine. 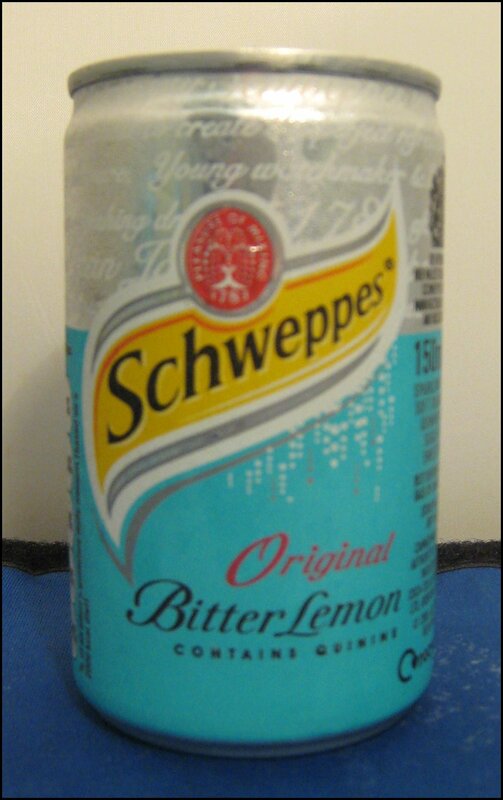 The first thing that I noticed about Schweppes Bitter Lemon was the distinctive blue-green hue. This not the original shade of the product; the colour was added at a later date. 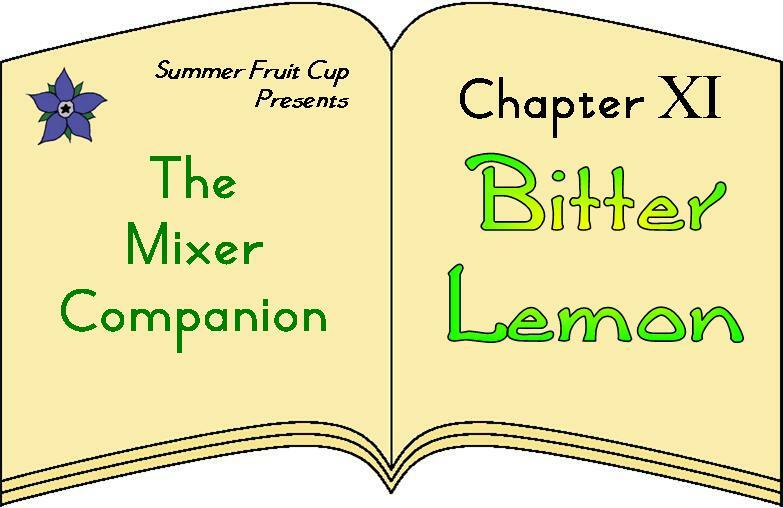 The bitter lemon had a high level of fizz; the very first thing that you get is the fizz, followed by some intense bitter citrus notes, some sweetness and a dry, bitter, tonic-water-like finish. It’s similarity to tonic water is quite uncanny. 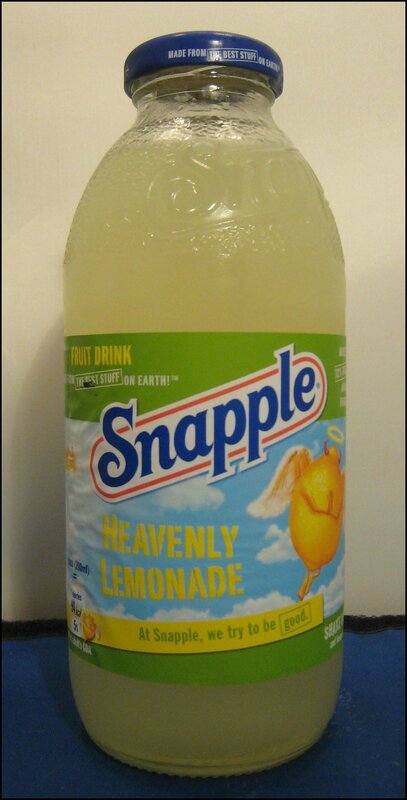 Not too sweet, this was quite acidic. This bitter lemon had a medium level of fizz and was a more natural yellow-green. Very tangy, the lemon seemed to contain a relatively high amount of citric acid. There was some bitterness and a cloying sweetness. It was also a bit syrupy and slightly chalky. Really, this was all over the place in terms of flavour profile. This was a cloudy, white liquid with the barest hint of green. With a medium-to-high level of fizz, the flavour was soapy and lemony with a hint of almond, of the kind found in cherry bakewell tarts. The whole flavour was over quickly, but not too bad. Light and cloudy with a green tint, this had a medium-to-high fizz. This was a more natural-tasting lemon with a fuller, fruity flavour. Whilst initially intensely bitter, this was balanced out by a lemon marmalade sweetness. Green-yellow in colour, this had a medium level of fizz and a good amount of quinine bitterness followed by some zesty, tangy lemon. Clean and not at all cloying, this also had a tiny hint of vanilla. Very balanced and very tasty. Add all the ingredients to a pan, bring to the boil and simmer for 20 minutes. Leave to cool, strain through a sieve, then coffee filter and bottle. Mix one part of your newly made Bitter Lemon Syrup to two parts soda water, and serve with ice. For an extra treat, add an ounce of your favourite gin. The most popular Sloe Gin cocktail is the “Long Pedlar”, named as such because it was a long drink made using the Hawker’s Pedlar Sloe Gin although, today, it can be used with any brand. A similar drink, the Sloe Pedlar, uses Lemonade. 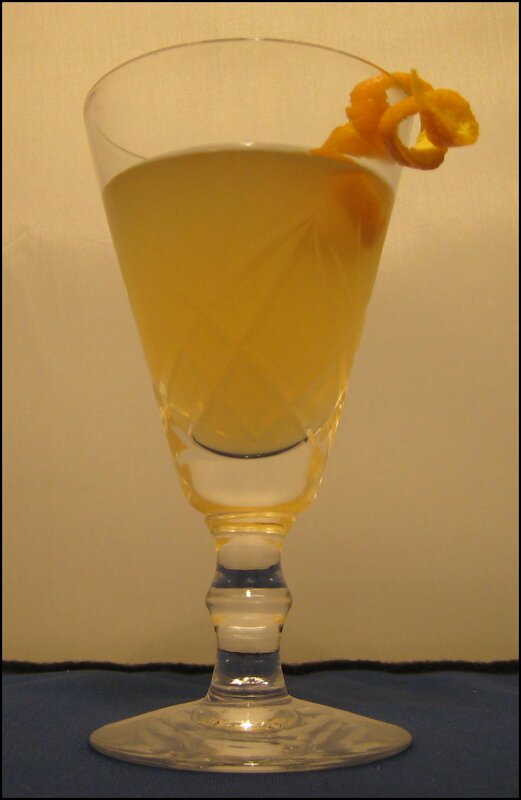 A a pleasant bitter sweet mix, sweet sloe and almond comes from the gin and the bitter lemon is a great contrasting companion. Very refreshing. 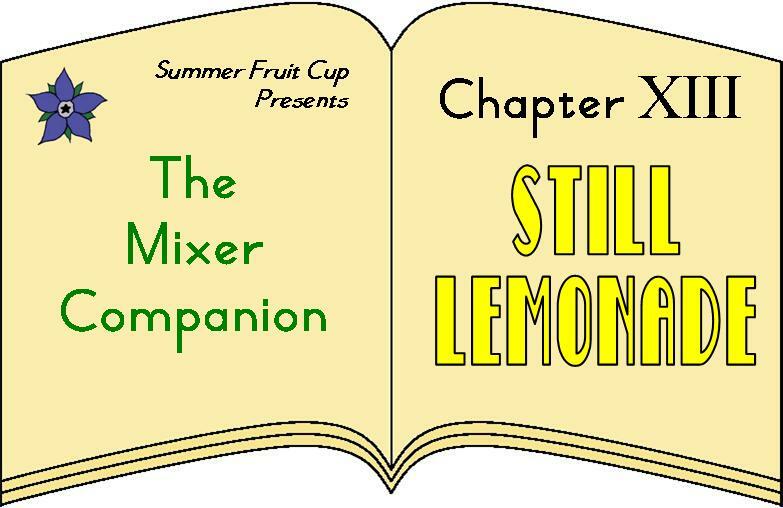 Posted in Mixer Companion	| Tagged bitter lemon, history, ORIGIN, recipe, schweppes, who first created bitter lemon? 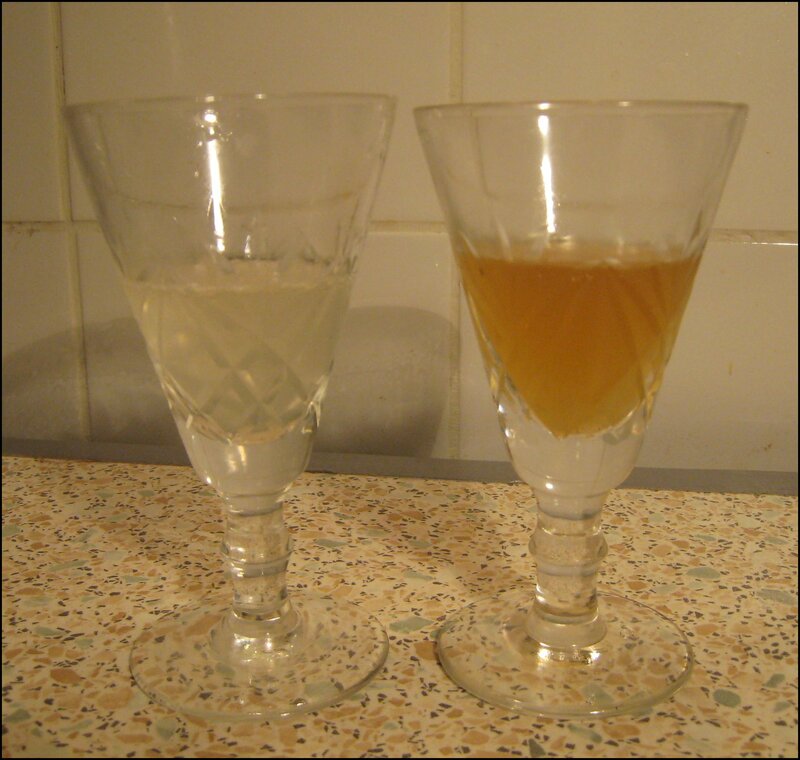 In the book “Ginger East to West”, Bruce Cost* argues that early brewers would often have used spice, such as ginger, to purify the ferments (beers) as the yeast at the time was unreliable. He also points to a reference to ginger and ale in Shakespeare’s Twelfth Night. The first accounts of ginger ale as we know it are from Northern Ireland (around 1850) and bottled ginger ale has been available in the USA from 1861. 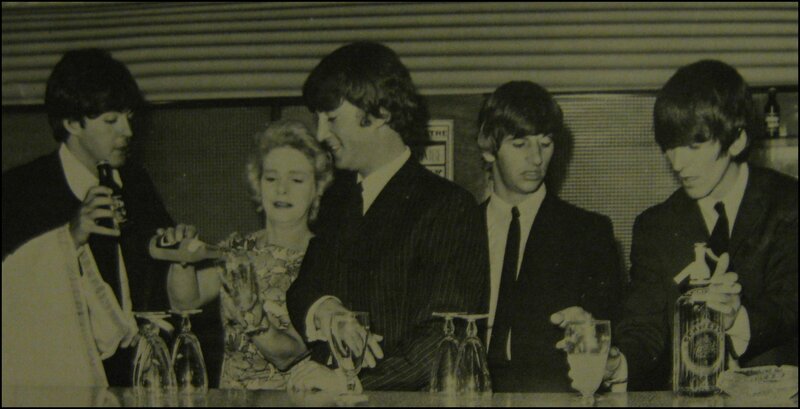 The ginger ale at this time was rather different to that which we’re used to today; now known as Belfast-style ginger ale, it was heavier, darker, sweeter and more syrupy, with a stronger flavour of ginger. This was the prevailing variety of ginger ale until the early 20th Century, when, whilst returning from a trip to France, the founder of Canada Dry decided that he wanted to make the Champagne of Ginger Ale; up until then, he had only made the sweeter, spicier Belfast style. Through his innovation, Dry Ginger Ale was born. 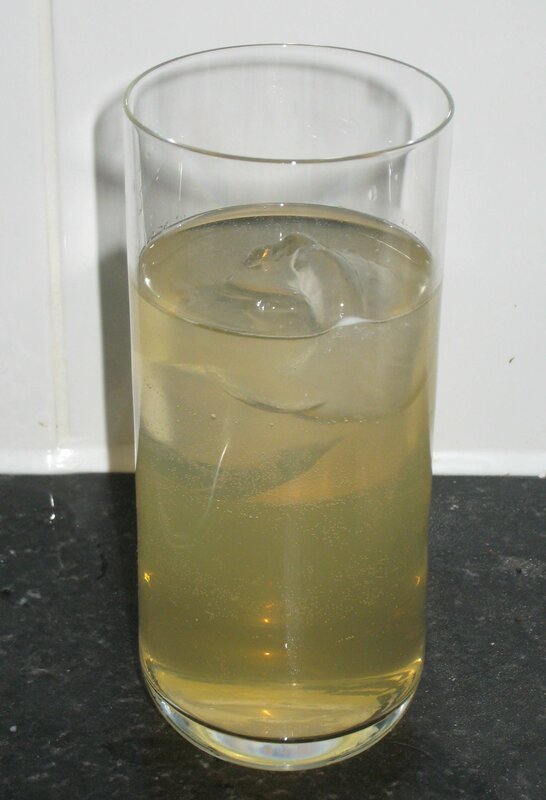 By the middle of the 20th Century, Dry Ginger Ale gained in popularity, aided by the rise of the cocktail hour and its mixability with spirits. It has to be said that this came at the expense of the Belfast style. Embury laments the availability of good-quality ginger ale, although he does recommend both Canada Dry’s Ginger Ale and their Soda Water. He goes on to urge the readers to not fall for the “calorie-free hooey” when mixing tall drinks and that they shouldn’t “ruin a good drink for the sake of a silly fetish”. I’ve prattled on for long enough; let’s get onto the tasting. 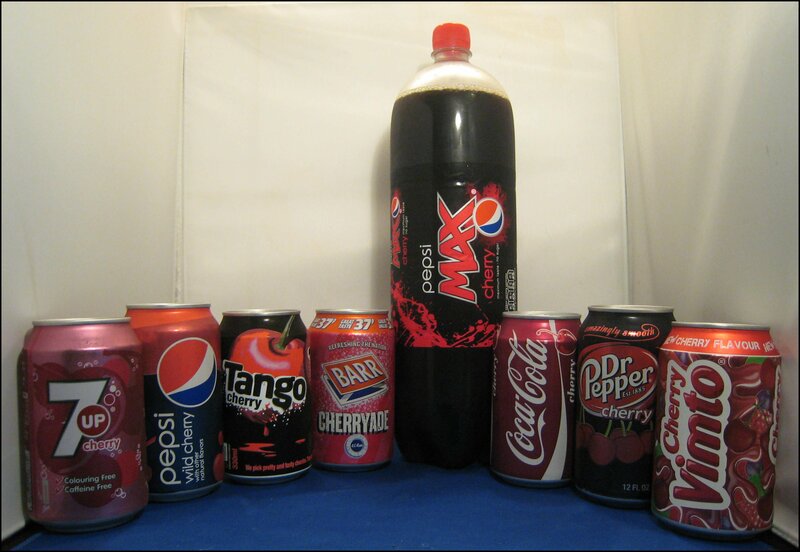 The five varieties were tasted blind on their own. High fizz sweet with ginger and creamy notes then some citrus. Quite palatable, easy to drink, would mix well. Would be nice with a wedge of lemon. Canada Dry Ginger Ale is available from most supermarkets for around £1.10 for 1 Litre. A relatively recent entry to the Ginger Ale Market from the Boutique Mixer Maker Fevertree. 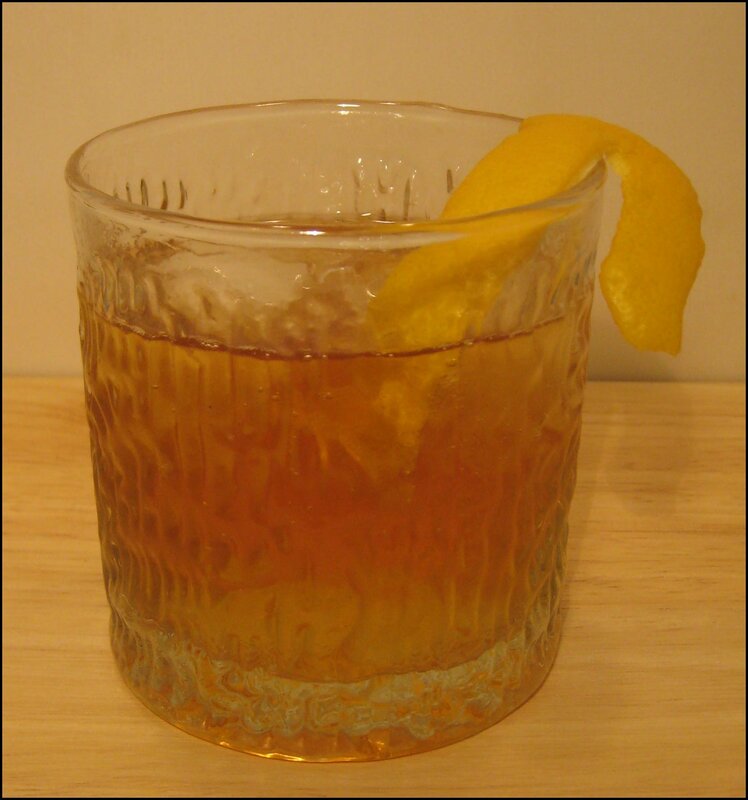 A light musky ginger, with a medium fizz. although initially quite subtle flavour the spicy fire grows and leaves some real warmth. Quite enjoyable. Fevertree Ginger Ale is available from Waitrose at £1.49 for 500ml. 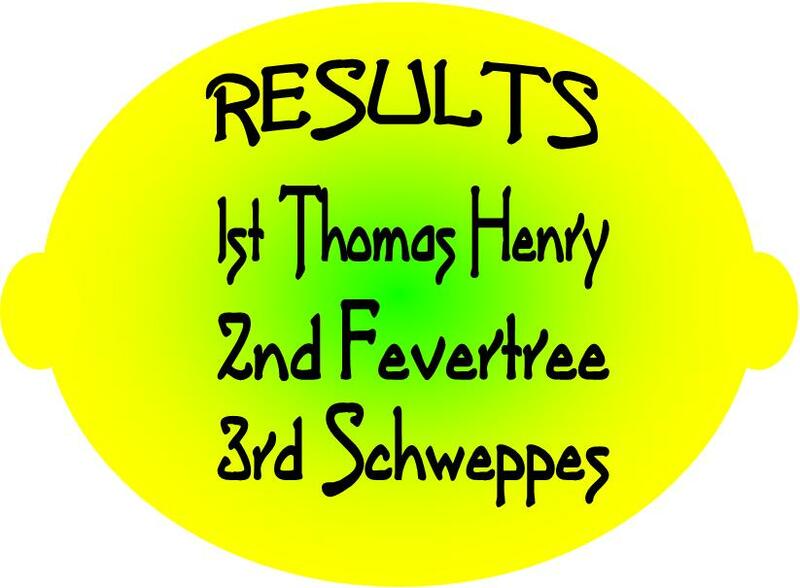 From the German-based firm named after Thomas Henry an historical pioneer in soft drinks. High fizz, quite clean, slightly sweet with a growing warmth. This would work well as a mixer although it’s hearty flavour makes it quite good on it’s own. It also makes a superb Horse’s Neck. Thomas Henry is not yet available in the UK – if you are interested in distributing it please Contact Them. A new offering from the folks behind the high-end Q Tonic water. Q Ginger really ginger root and is sweetened with organic agave. Coriander, Cardamon, Rose Oil and Orange Peel are also in the mix. This had the most intense nose of the selection. It had a medium-high fizz with some ginger and dry at the end. Although initially the warmth is subtle it builds as you continue to drink, after a few sips there is a decent fire. Some citrus lemony elements too. 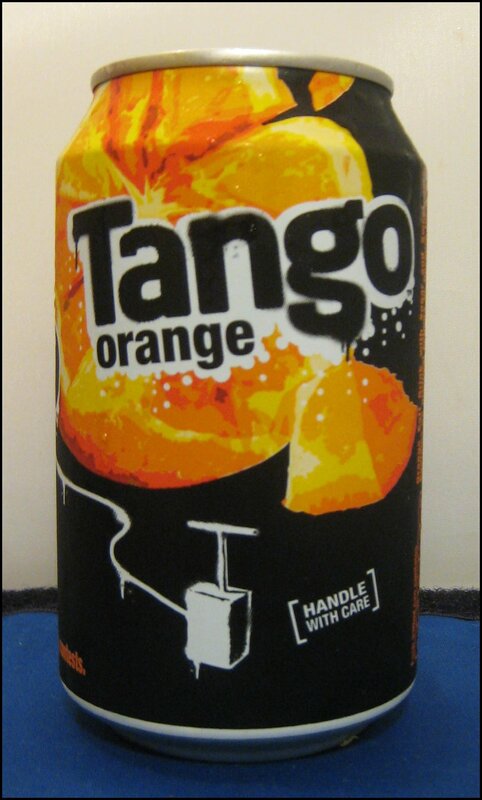 Q Ginger and Q Tonic are not currenlty available in the UK – if you are interested in distributing it please Contact Them. Released this year in addition to an array of spin-of products from the success of the company’s Ginger Wine and Alcoholic Ginger Beer. Very different but also quite sweet, a low fizz and a rich syrupyness like Old Jamaica Ginger Cake, when I found out this was the Crabbie’s version I thought that it was rather like ginger wine. Despite being quite a different flavour it was still quite nice. But what if you fancy the home-made variety? Add ingredients to a pan and simmer for 20-30 mins, allow to cool, strain, bottle. Keep refrigerated. 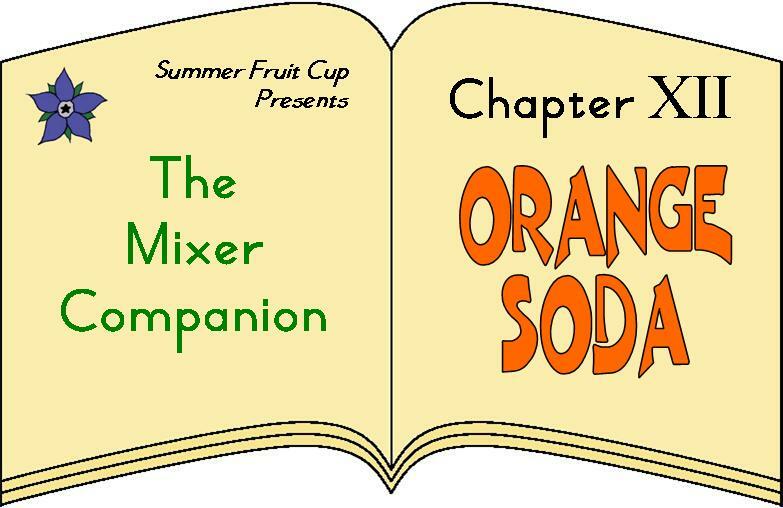 To drink mix 1 part syrup to 2-3 parts soda water, or to taste. Juice and Zest of one Lemon plus a tsp of pith. Add ingredients to a pan and simmer for 30-40 mins, allow to cool, strain, bottle. Keep refrigerated. 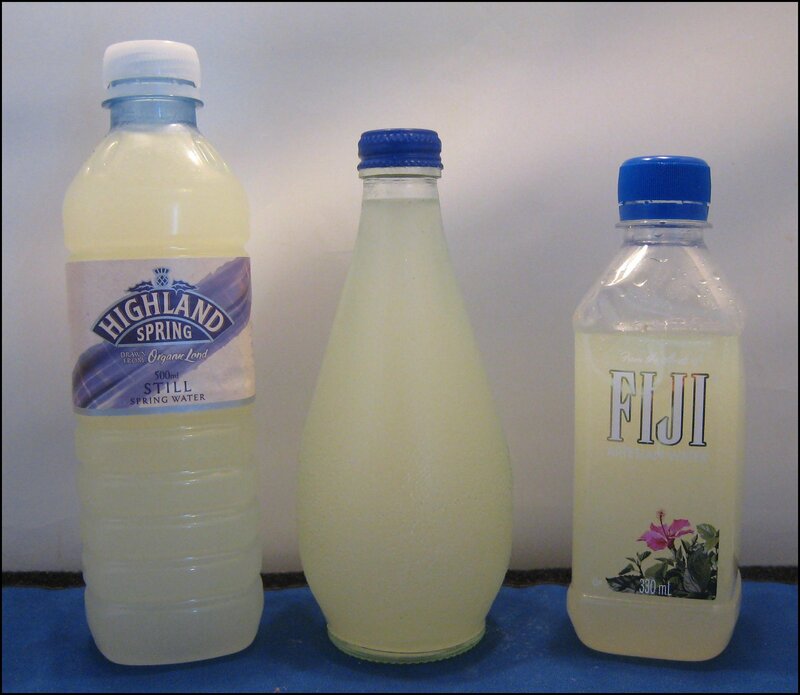 Once you discovered and/or made your favourite Ginger Ale, it will make a fine drink on it’s own, but what if you fancied a mixed drink? 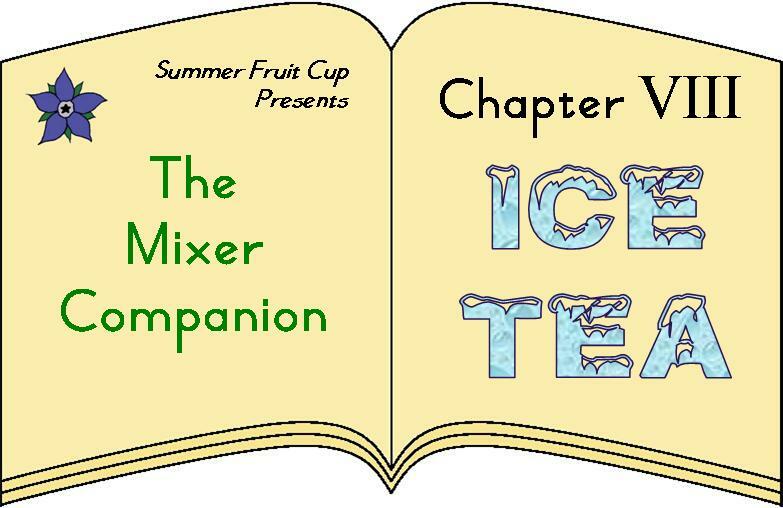 Add ingredients with ice to a tumbler. I was not sure where to put these other tidbits so they’ll go here. Ginger Ale is often seen as a cure for upset stomachs, motion and seasickness. I’ve found little scientific evidence but a lot of anecdotal notes. Maybe it’s the power of the placebo but, if it works…. In James Bond films Ginger Ale is used to substitute Champagne whilst filming, the resemblance is uncanny. Apple juice is used for Whisky and Bond’s Martinis are nothing but water. 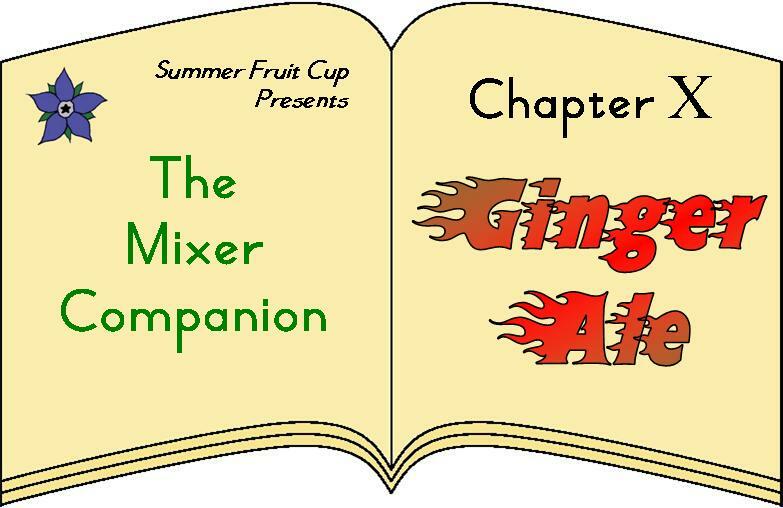 * Bruce Cost is also the man behind REAL Ginger Ale for our further thoughts click here. 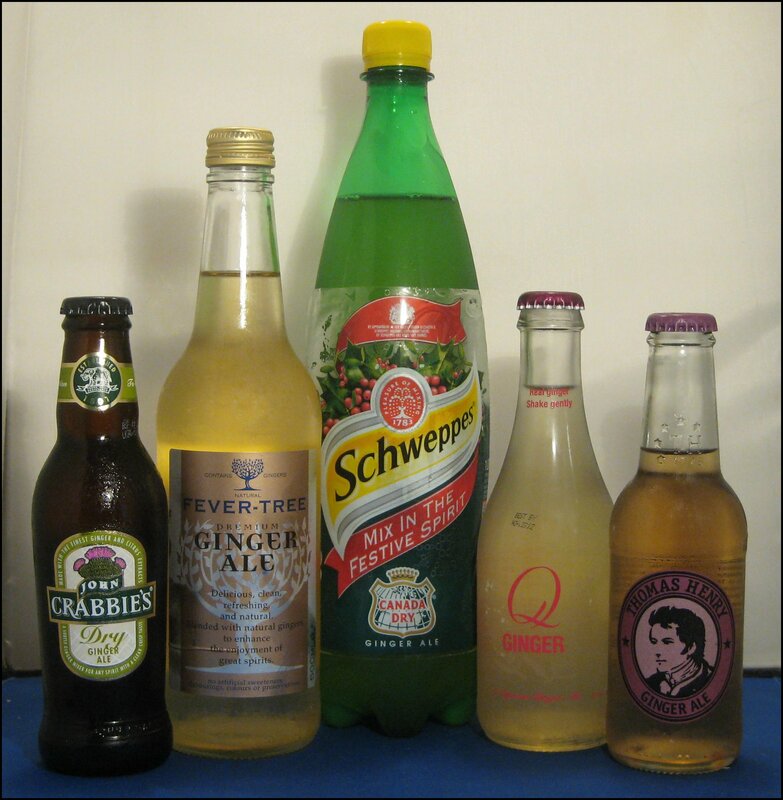 **The Schweppes variety may still be separately available in the USA; I do remember having Blackcurrant flavoured Schweppes Ginger Ale (not Canada Dry) when I was in New York. 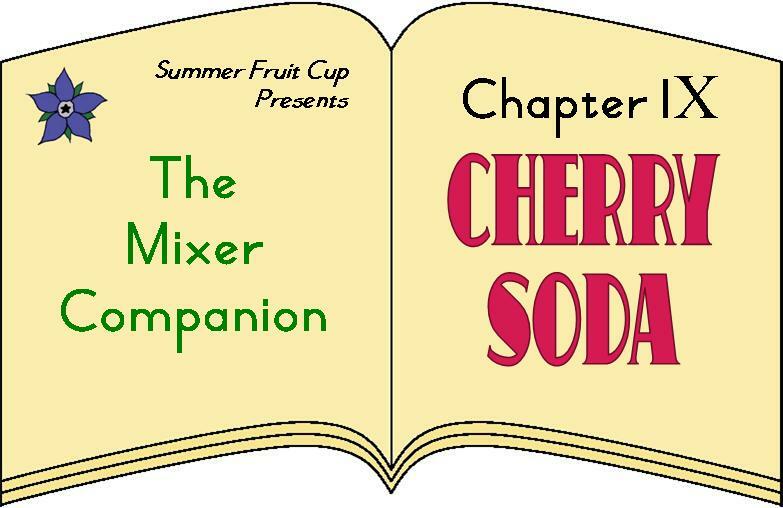 Cherry Soda, unlike most of the other mixers that I’ve featured so far, is less of a category and more of a catch-all-term for anything which is soft (non-alcoholic), fizzy and tastes of cherry. 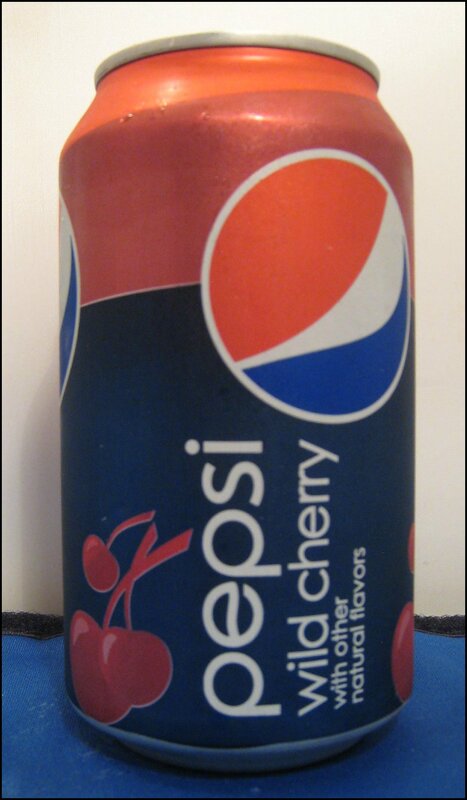 Often, it seems that Cherry Soda is a spin-off from an already successful product such as a cola (Cherry Coke, Pepsi Wild Chery), lemonade (7-Up Cherry), or whatever Dr. Pepper is. 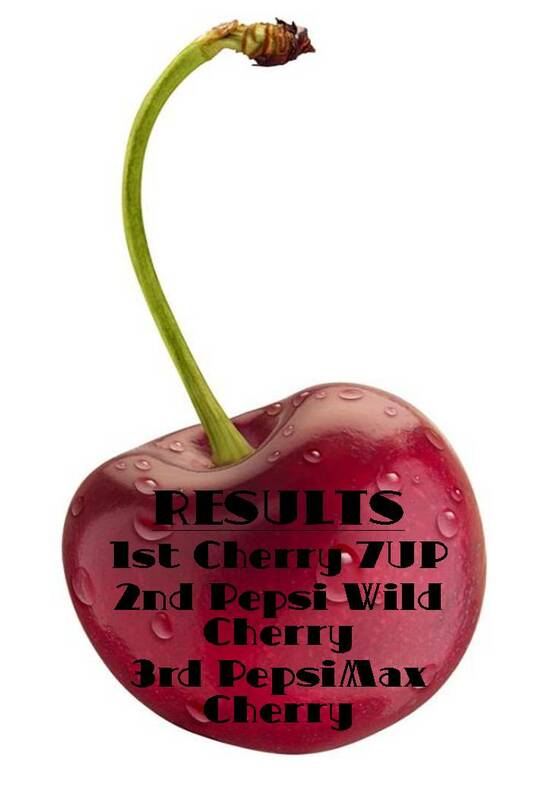 As such, it doesn’t really have a defined history, although cherry soft drinks seems to have been around since the 19th Century. 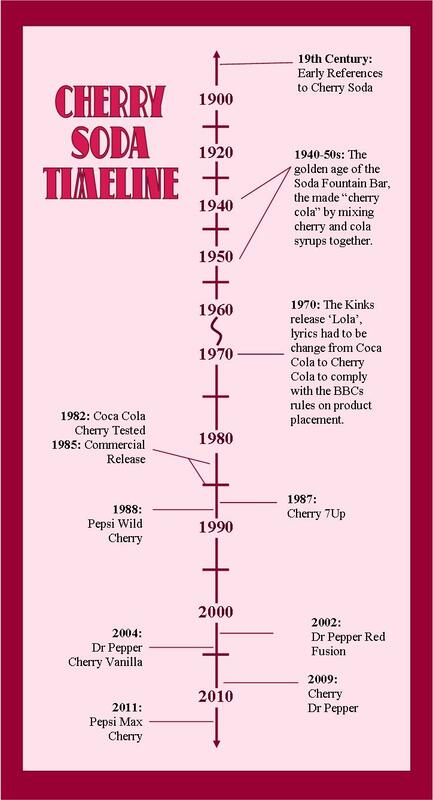 Given this lack of information, I have created a Cherry Soda timeline, marking major events in its history. 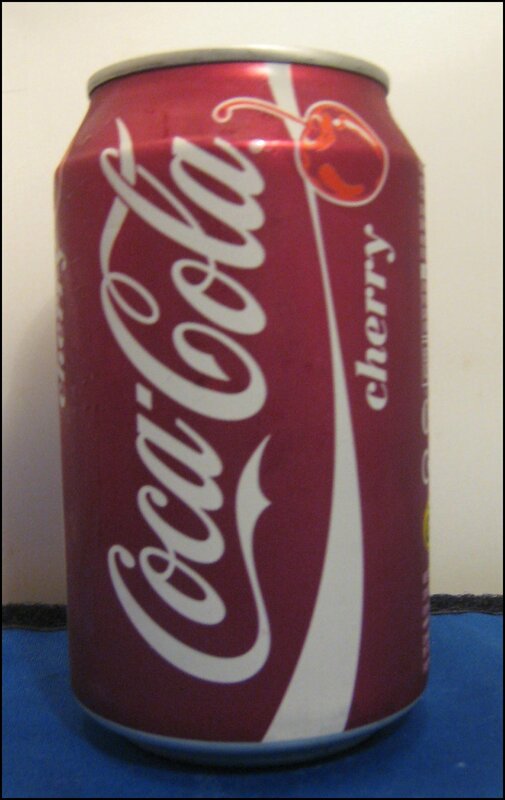 2) Cherry Cola – cola (including Dr. P) that has been flavoured with cherry. 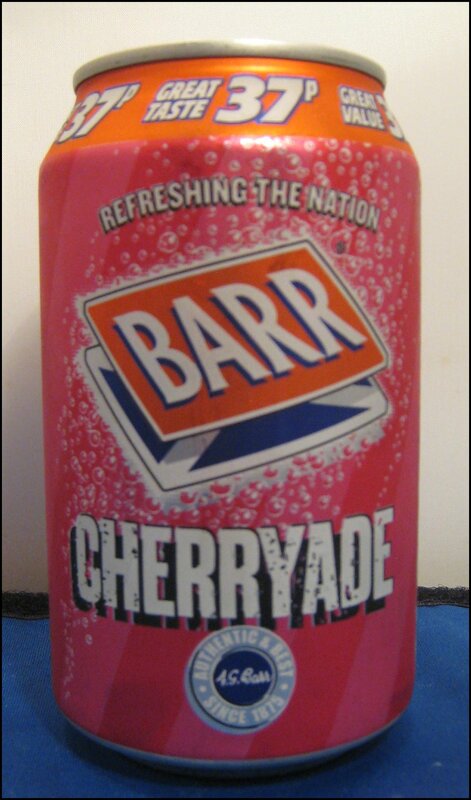 This smelt of sweet cherry jelly, being reminiscent of “pop-shop” cherryade. Magneta in colour and with a medium fizz, we found it to be pleasant; there was a morello cherry flavour that was quite refreshing. 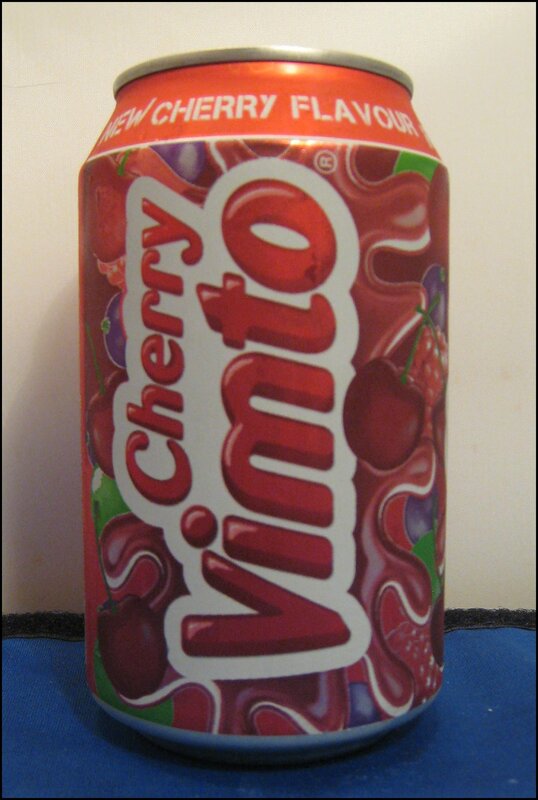 This had a distinctive smell of red cherry sweets and a deep red colour. With a medium fizz, it was full of the flavour of juicy cherries with a little bitterness afterwards. Some of our panel found the flavour to be a bit too intense and all disliked the cloying, squeaky-teeth feeling at the end. Unlike the previous two, this one smelt of dried, sweet almond and dried cherries. I’m always surprised that this is clear. 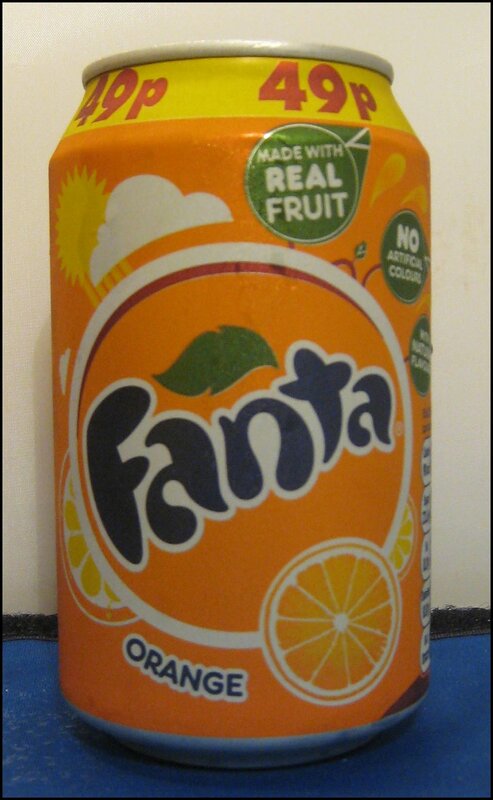 It tasted sweet with a sour note, but was quite fizzy. Overall, this was fruity and well-balanced; an easy favourite of the panel. This smelt bright, with lots of sweet cherry. It also tasted quite sugary and syrupy, with lots of sweet cherry, but was also rather cloying; after a short while, the flavour just dropped away, leaving a watery finish. This had a strong nose of cherry and vanilla and was very fizzy indeed. Sadly, the taste seemed to be rather minimal; some of the panel were quite familiar with it and noted that the flavour does increase as the drink warms up. The primary taste was of almond and marzipan. Released in 1988 this is primarily available in the US. This had a clean nose of zingy cherry, with a hint of toasted almond. The taste was great – cool and crisp. 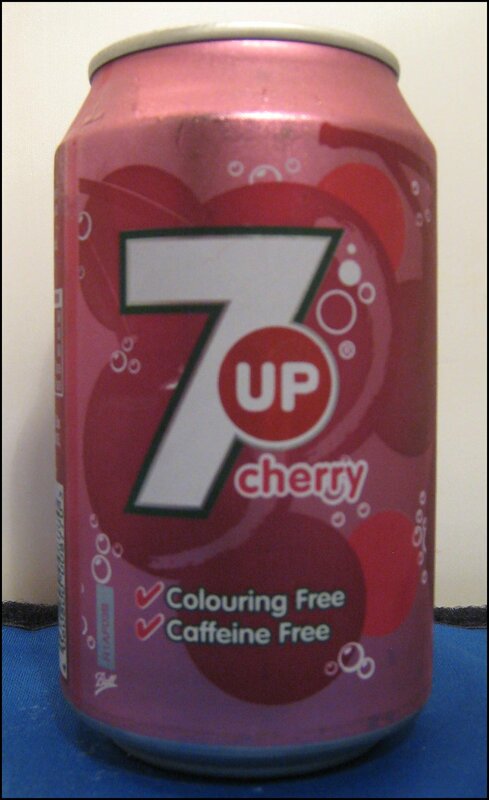 There was a balanced sweetness with a lasting, tangy cherry flavour, accompanied by a medium-level of fizz. This was well-liked by the panel. This is a recent addition for the UK market, which was launched in October 2011. With a balanced nose full of strong notes of cherry bakewell (cherry and almond), this had a medium-to-high fizz. Released in 2009, this is primarily available in the US. 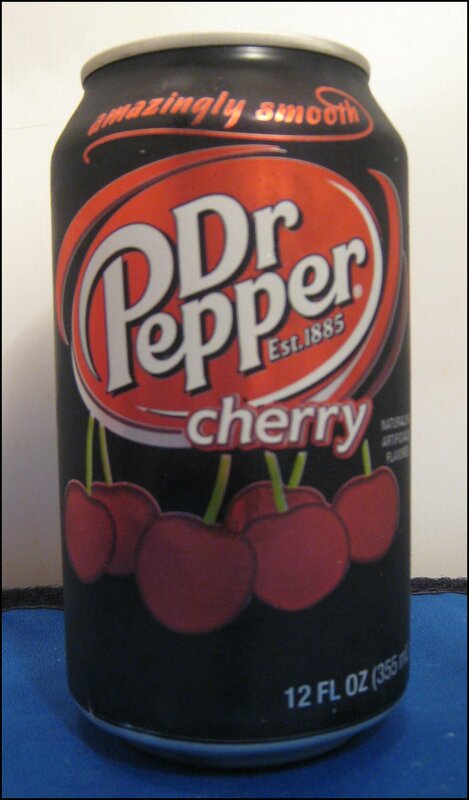 Dark chocolate brown in colour, this was very similar to Dr Pepper, but with perhaps a touch more cherry (although this could be at least partially down to suggestion). This has a high level of fizz and is slightly creamy. We found it to be enjoyable to drink, but very close to Regular Dr. Pepper. 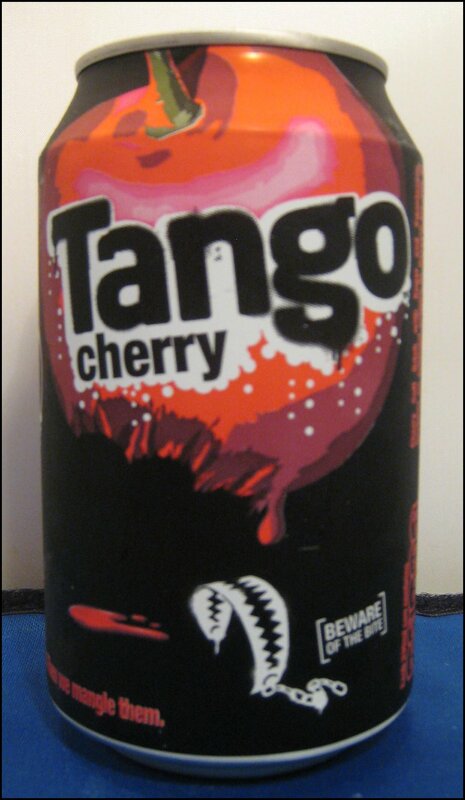 Rich morelo cherry flavour, with hints of vanilla. Very tasty, nice texture, quite fruity and not too sweet. Maybe a touch hollow at the end but overall, pretty good. Typically, this uses Malibu Coconut Rum, but as I had none, I thought that I’d use Hoxton Gin, which has quite a strong coconut element. Although tea has been drunk for centuries, ice tea or iced tea is thought to have originated in the American South. One of the oldest recorded references to it, an appearance in a South Carolinian cookbook, is from 1795, although the first “modern day” recipe comes from the 1879 book, ‘Housekeeping in Old Virginia’; interestingly, the latter was made with green tea. Today, ice tea is available throughout the U.S. and across the world, although it seems to continue to enjoy a great following of folks from the Southern States. 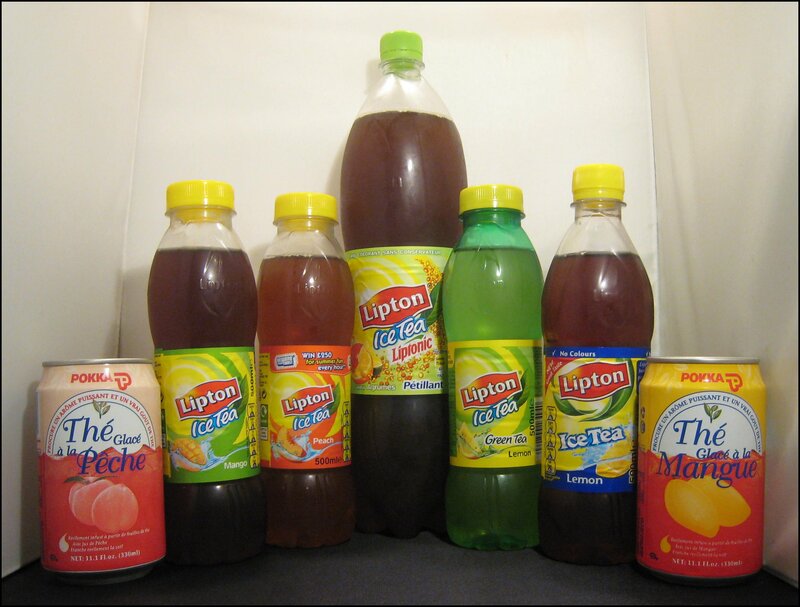 In the U.K., the biggest brand is Lipton, although Nestle’s Nest-tea is available in some locations. Quite fresh, this had crisp hints of fresh lemon and then black tea. There’s an obvious dryness from the tannins at the end. Not too sweet and, although it could use a bit more flavour, it was nonetheless rather refreshing. Slightly darker than the Lemon variety and with a ripe peach nose. This had a well-rounded, fruity taste; the tea flavours were still there, but weren’t so pronounced. Full flavours, with some dryness at the end, but – overall – refreshing. The smell of this one was rather horrid, like stewed tea and slightly overripe fruit; very off-putting. To taste, this was very different to the Lipton: much sweeter and slightly musky, with some additional floral elements. We found it difficult to taste the tea very much as it was a bit sickly; so much so, that it was difficult to finish the glass. This was the darkest of the Lipton teas and was quite fruity, with a strong mango flavour that remind me of mango sorbet. There were some black tea notes, but the tea came across mostly via the tannins at the end. Despite this, it was quite sweet, but easy and pleasant to drink; merely not quite as refreshing as the peach and lemon versions. This was another variety with an off-putting smell: hints of rotting cabbage and stale teabags. It was also far, far too sweet, rather cloying, very sickly and, again, the fruit tasted past its best. Finally, there were hints of bitter mint leaves at the end. Not recommended. A light yellow-green in colour, this had an intriguing, oyster-like nose with a hint of copper. Clean and crisp, the flavour was distinctly different and made for a nice change. The tea came through well and the lemon gave it a nice lift. A less intense, less sweet variety. The first batch of ice teas that we tasted were all based on unspecified black or green teas, but what if you use a different sort of blend? This was notably dark in colour and, suitably, was full of dark, floral flavours and rich, bitter tannins. The flavours then moved towards floral citrus and bergamot. Altogether, it was rich, succulent and very tasty. We found it to be exceptionally refreshing, with some intriguing hints of chocolate on the finish. Frankly, superb! This ice tea was very pleasant: not too sweet, nor too bitter. I found it to be reminiscent of home-made varieties. There’s a dryness from the tannins and a touch of citrus. 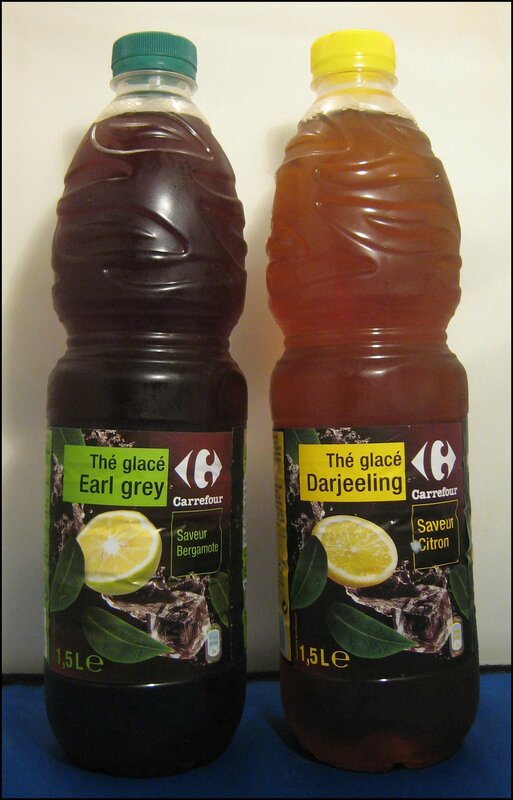 It’s a bit floral, but overall there’s no discernible difference between the Darjeeling and unspecified black tea. Quite fresh and worth trying. Ice tea is one of the easiest and cheapest soft drinks to make at home. You also have a lot of control over the sweetness and taste in general of the final product, making it a good one to try. US President Gerald Ford was rather partial to home-made ice tea. An easy recipe, basically you’re just making tea and adding sugar and lemon and chilling it. Add boiling water to a saucepan. Allow to cool, bottle and chill. Quite pleasant, jammy then some dusky chocolate notes. I think the rum compliments the tea well. Rather an unusual drink but very refreshing with a hint of almond on the finish. Rather pleasant but as my Ice Tea is not very sweet I needed to add a dash of sugar syrup to balance the drink. Cool and refreshing it fits in nicely with a lot of the work Cognac producers, such as Courvoisier, are doing to promote the mix-ability of Cognac. Very pleasant, quite orangey which comes from the botanicals of the gin, the bergamot of the earl grey ice tea and the garnish. crisp and very very refreshing, great for a slow summer afternoon. I’m hope Her Majesty would approve.